What is Karton? Karton PH advocates everything gourmet and the best part is that they are all made from the Philippines. 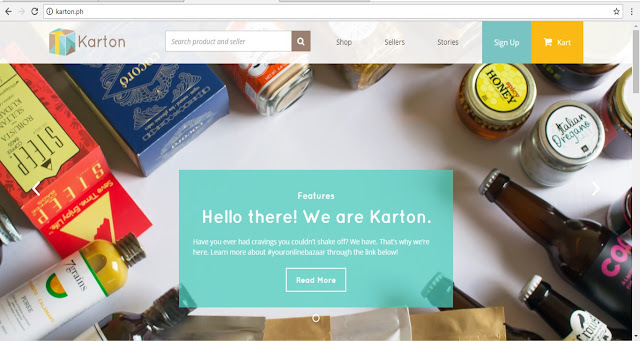 Karton is taking another step and that is offering home and lifestyle items This is the Karton Life. A whole collection of home and lifestyle products that’s perfect for a life out of the box! These new product categories include soaps, perfumes, and handmade craft goodies. Ordering gourmet products online has never been this easier. Yep, you read it right because now, there’s an online marketplace where you can find delicious, mouth-watering gourmet creations by Filipino artisans from all over the country. Here are some of the exciting gourmet products we found. this Greek dessert, and that is the queso de bola shavings! The family-run bake shop came up with the recipe for this rich Blueberry Cheesecake after tasting every pie and cake they could get their hands on. This Blueberry Cheesecake will roll off your tongue smoothly. Its perfectly creamy texture is heightened with just the right amount of sweetness. The queso de bola shavings on top of the blueberries make it even more scrumptious. At PHP 845 for a 9-inch cake, this Blueberry Cheesecake is one of the most delicious yet most affordable in the market. They also come in 6 inches and 3 inches if you don’t want to ruin your diet too much. Shelf Life: 10 days when refrigerated. Honey infused with chilis? You must be mad! But, as they say, spicy honey is the new Sriracha. Filipino artisans at Mad about Herbs created their own version of the latest trend, and it’s just fantastically awesome. It’s great as a condiment or ingredient in anything! You can drizzle it on pizza or over steamed veggies. Spicy honey can make your roasted chicken and barbecue dishes taste uniquely delicious, too. You can even use spicy honey to “spice up” your favorite dessert. It’s absolutely versatile. Salted dried fish or “tuyo” is an authentic Filipino dish commonly served for breakfast. GMCS Farms has their very own version, combined with oyster mushrooms. Preserved in olive oil, and infused with garlic and herbs, GMCS Farm’s Mushroom with Tuyo Flakes offers a new twist to this Filipino staple. You don’t need to worry about stinking up the whole house when you cook tuyo at home. Just get this bottled delicacy and serve. It’s as simple as that. In Spanish, “de puta madre” is a term that refers to something utterly awesome, much like saying “the bomb” or “it’s totally sick.” As Crows Craft Brewing Co. Manila’s flagship craft brew, this beer is rich in aroma and taste with a darker, smoother touch. This artisan brewery pulled all the stops to create this craft beer, so if you’re a beer lover with an adventurous spirit, then this one’s for you. Salted egg potato chips are all the craze today, and Sikat Potato Chips isn’t far behind this trend with their freshly cooked potato chips. Boasting of 100% natural ingredients, these Sikat Potato Chips will surely leave you begging for more. It’s a perfect companion to your Netflix binge night or as a beer-match in your next inuman session. Shelf Life: Up to 14 days, unopened. Consume immediately after opening. Get to know the artisans behind these gourmet products and be amazed at the story behind the taste. Support local food artisans and buy Filipino. You’ll never be sorry, that’s for sure.